I have been a fish vegetarian for about 24 years and my daughter for 8. I think I eat well, but once I hit the wonderful decade known as my 40’s – the weight started adding up and it was SO much harder to get rid of it – wow! I started to really look at what I ate and the balance between fruits, veggies, grains, protein, fat and realized that I hardly ate any fat! I have never been one to follow the government recommendation for a low fat and no fat diet – we need fat and children especially need fat!! Our brain relies on fat for nourishment. I will stay off my soap box in regards to fat and the recommendation to avoid it and what I think will be the next medical crisis. I could not figure out how to get a better balance of fat into my diet and how to loose the weight that has been slowly creeping up and settling on my hips, stomach, waist and OMG I have back fat!!!! It has to go and now!!!! I am also back in school for integrative nutrition, so I am being exposed to so many diet philosophies – that from there I am trying to find the right balance and the “right” life-style diet for myself. 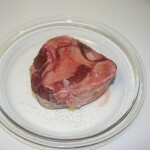 I have decided to add meat back into my diet – Stella will not and I will respect that (some). This decision has been a hard one for me, but when I recently was with a group of people and one of them was eating a bacon and egg sandwich and my mouth was drooling – I took it as a sign from my body – saying hey we need that! I have eaten, organic chicken twice – the first time I was not feeling so well afterwards, but I made it through the night. I have also had bacon a couple of times and cooked my eggs in the fat. I am taking this very slow – my body is not used to this much fat in my diet and it has been 20+ years since my digestive track has had meat go through it! 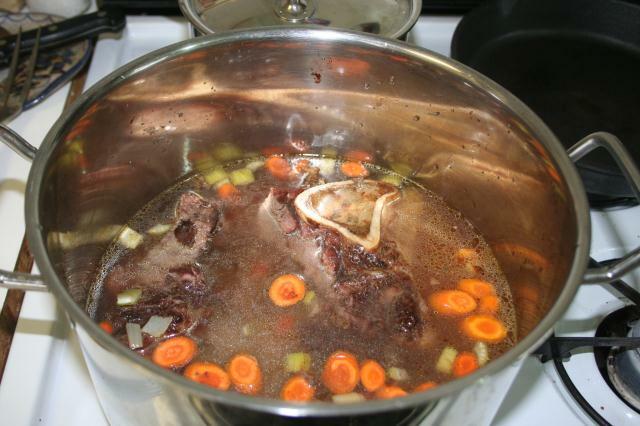 Reading up, bone broths are suppose to be wonderful for you – full of nutrients, Vitamin A & D and cleansing of internal organs, especially the liver. 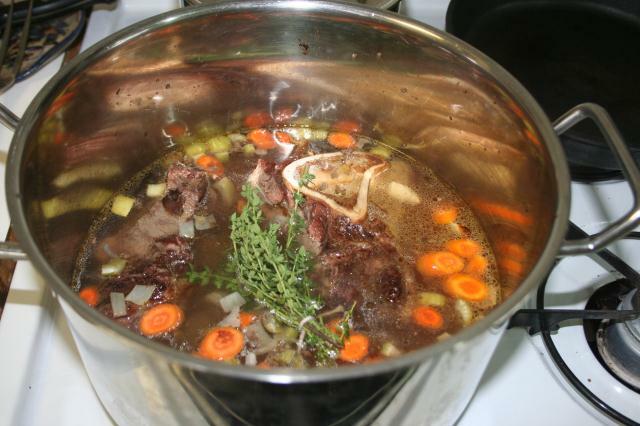 I have never made meat broth before – I did my reading and thought I was ready. 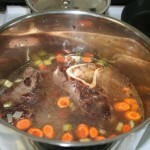 Having got my bones (with meat and marrow) from the private member co-op I belong to – I set about making my bone broth. 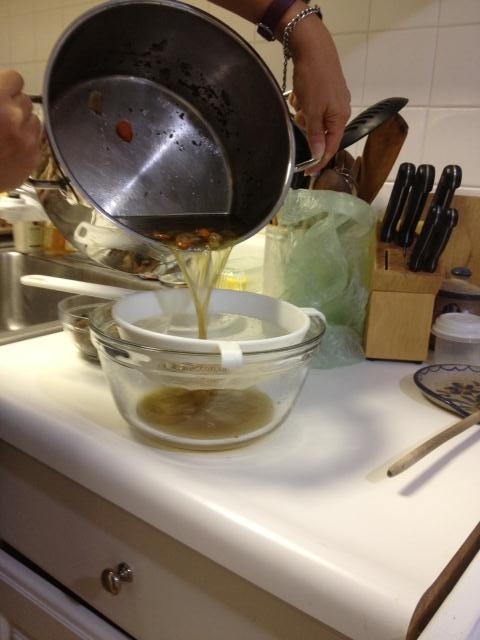 I need to confess a few things… First, I was very intimidated by the process of making bone broth. I call my mom many times, to ask, looking back, very silly questions. 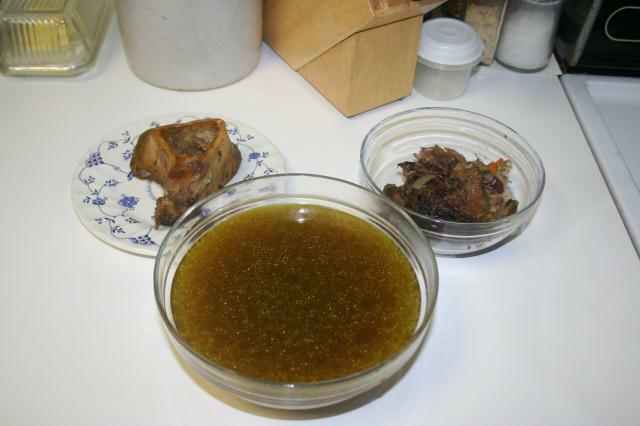 When the broth was done – I had to call again to ask what was I suppose to do with the meat! 1. 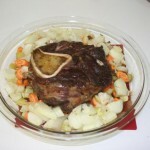 Place the bones with meat on them into a roasting pan and bake at 375 degrees for about 25 minutes. 2. 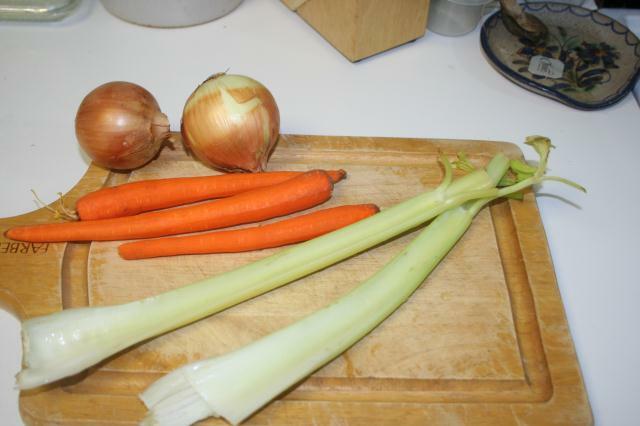 Cut up some carrots, celery and onion. 3. 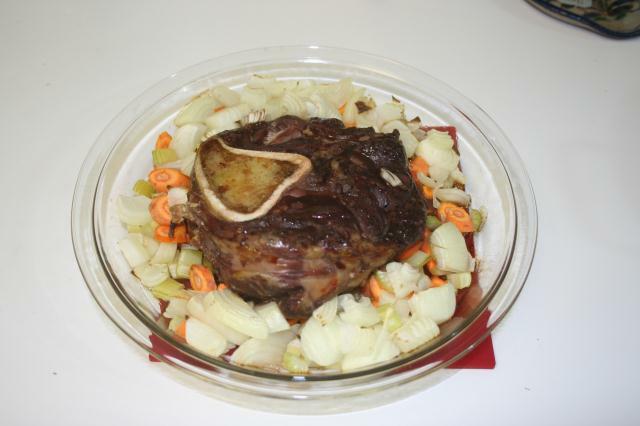 Add the veggies to the bones and bake for another 20 – 30 minutes – you want the meat to be browned. 4. Add the bones and veggies to a soup pot. Add water to cover the bones. Turn the heat on to medium-high. You want to bring the mixture to a boil and then turn down to simmer. 5. 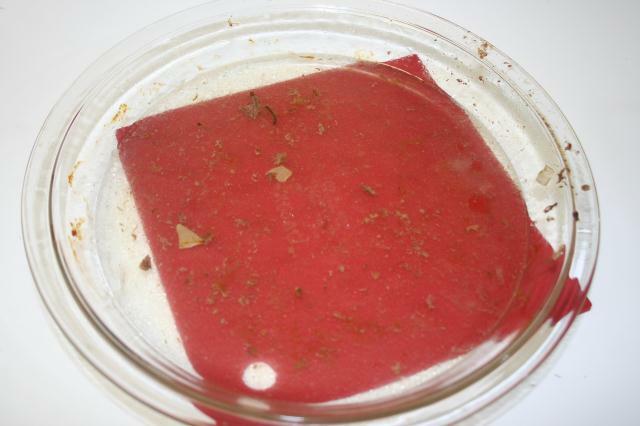 Pour some cold water into the roasting pan and scrape off the brown bits on the bottom on the pan. 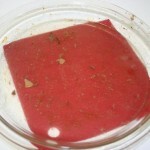 If they do not come off easily – heat the pan on the stove and scrape off. 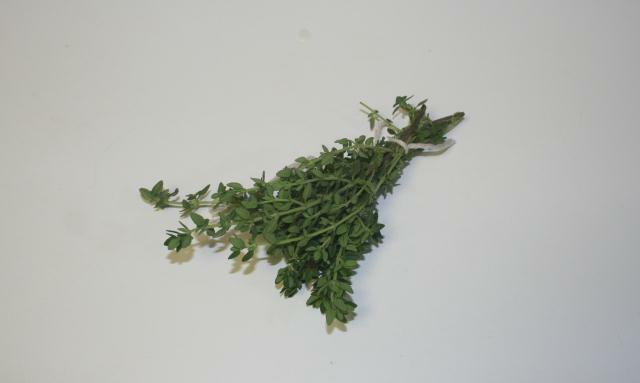 Add this to the soup pot. 6. You will want to skim the fat off the top of the broth. 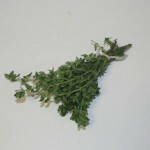 Tie up some thyme and add to the broth. 7. 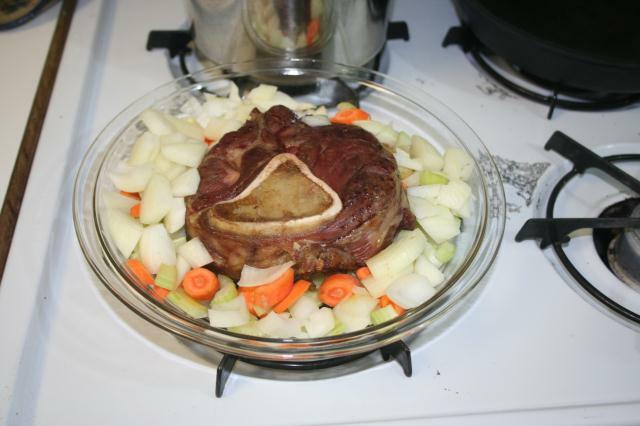 Allow to simmer for 6 – 12 hours. 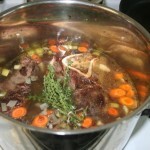 The longer it cooks, the less broth you will have, but more nutrient dense. 8. I allowed to cook for about 9 hours. Turn the burner off and allow to cool slightly. 9. Pour the broth through a colander into a bowl. 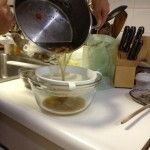 Place the broth in a container and refrigerate. The meat I froze for when I make soup later and the bone went to the dog! 10. 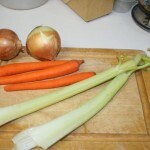 The next morning – I took the fat off the top of the broth and then froze the broth for use when I make soup or sauces. The broth turned out to be a very rich brown. 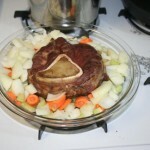 While cooking the soup – Stella commented on how good the house smelled and wanted to know when the soup would be done. When I told her what I was making, she turned up her nose and said she would wait for veggie soup, that is when I told her that this broth was going to make the veggie soups taste so much better. No comment from her – I don’t think she understood what I was implying. 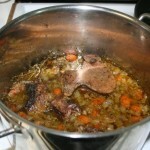 This entry was posted in Recipes, Soup and tagged beef stock, bone broth, broth. Bookmark the permalink. The broth looks great and it does make a huge difference to have good broth. You are amazing!! Pamela- Funny thing is I have beef soup bones from buying a part of cow and was thinking about making broth but had never done it! 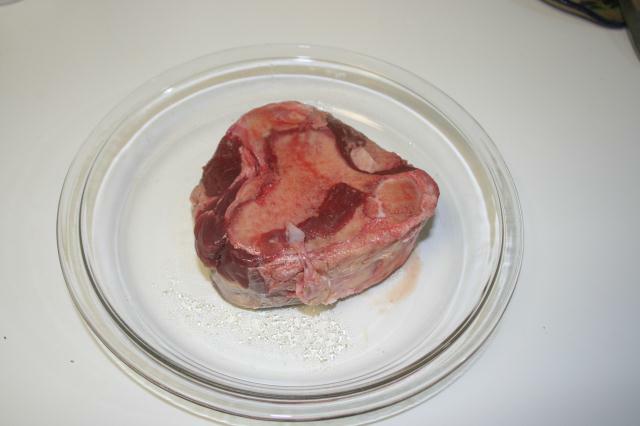 I question the taste of the beef to save for soup when it has already been cooked for SO long. Did you taste it by any chance? Not that it would be “bad” but I ould think it wouldn’t have much taste. 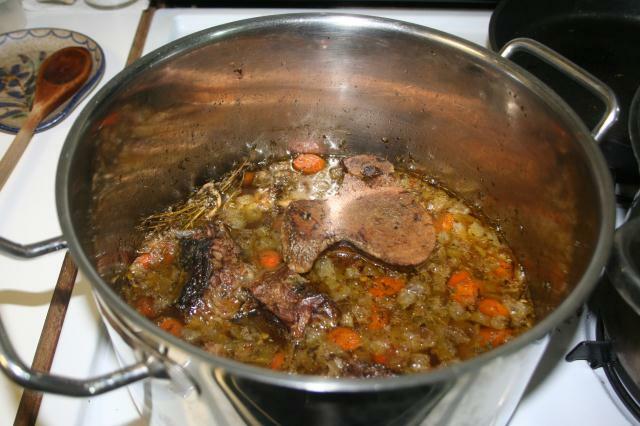 I know when I have made chicken broth I take as much meat off the carcass as I can to put in the soup afterwards. Great to be receptive to change…great recipe. 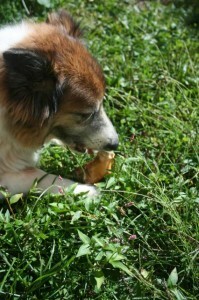 Yummy for the pup !